All addons should be well coded, but considering the state of "modern" computing it's rather problematic. Orwellianly the bug is gone and everything works as intended. No matter how hard I tried, there seems to be no way to reproduce it. So I suppose we can say it was a problem on my side. Thanks for your help (and for your plugin)! Does not function in FF v3.6.28. Tested with clean/empty profile, add-on versions 1.9.7, 2.2.3.0, 3.1.0.2. Installs without warnings, is listed in add-ons list, but no menu item under History menu group. Also, nothing happens when "chrome://norwell/content/norwell.xul" is executed. Installs and functions in FF v23.0.1 Portable without issues (at least there is menu item, that opens Norwell tab). I was trying to add a delete function to your wonderful program so I can delete single page url from history after a search with Norwell. I successfully added a new menu item on right click, and attached an alert script to test it. All is working except the delete record script. But I cannot get it to work in the Norwell addon. UserMark wrote: I was trying to add a delete function to your wonderful program so I can delete single page url from history after a search with Norwell. there are literally gazillion of FF extensions for destroying and deleting firefox history. I don't think you ever need to delete your history. I guess those in position to handle mass surveillance databases and big data could start initiative to shape internet according to what people remove from their history by investigating and targeting these websites as source of some sort of evil for causing this unnecessary worrying condition bordering paranoia. Last edited by pirst on December 5th, 2015, 8:34 pm, edited 1 time in total. Fritz_Geiger wrote: Does not function in FF v3.6.28. Answer to both questions is "no". "No chrome package registered for chrome://norvell/content/norwell.xul". means that this package _is_ registered. and with presence of the add-on in add-ons list (under "Tools" menu item). I tested v1.2.1 and v1.3.1 - same results. v1.0.1 not tested (claimed compatibility starts from FF v30). I suppose that real compatibility of the add-on starts from FF v4. I'll test this in a few days and inform the results. Are we supposed to ask all our question about Norwell history tools in this one thread?! The text "About this add-on" (https://addons.mozilla.org/en-US/firefo ... l/?src=api) is rather about the reason for this add-on than about the add-on itself. And 1st of all, how does it work? I installed it (version 3.1.0.2.1 on Firefox 42.0 for Fedora 23 Gnome) but I can see no difference in Firefox" Open menu → History... I eventually understood that I can go to Open menu → Customize, and drag and drop "H Norwell" towards the menu, then click on that "H Norwell"... Is it what we are supposed to guess or is there an easier way? I'm sure there are ways in firefox to implement a better solution, but it will be limited as working approach to just a few firefox versions. If there is a firefox addon it should be able to be installed, backwards compatible and usable in all versions of firefox. Of course it's impossible task considering how firefox browser differs from version to version and still able to keep the name, branding, logo, etc creating some impressions that attracts attention about some markets being served under the table. That "drag addon icon to menu thing" has been with firefox since ancient times - i guess it might be a problem for those who are new to firefox. Ah. OK, thank you. This was because I didn't display the menu bar, but I guess that ifit was not displayed, it is because it is hidden by default in Fedora 23. Oh, here I am, thanks to Google I realized I had to click on Assistance rather than Support. 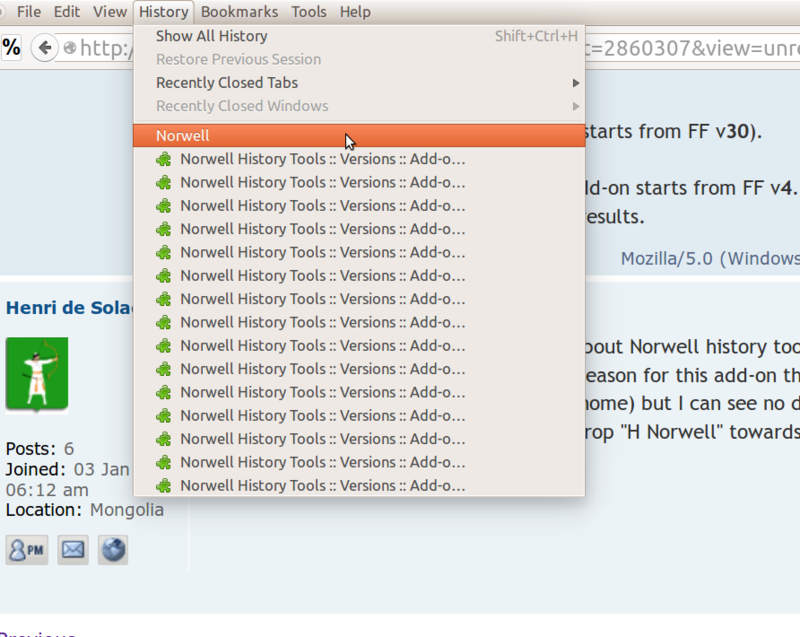 Well, I installed Norwell history extension, this gave me a nice interface when clicking on the H, but that only displays the current session. I see no modification in the Firefox History interface. Oh; I think I understood. I did not realize I had to enable the limits. I thought otherwise I was supposed to get the whole history, in fact no by default I get the current session (or perhaps rather the current day), and if you enable the limits and select a begin date you get the previous days. Also before the begin day, in fact ? that is correct. Norwell opens with history of todays date. You can execute search with any keyword right away on your global history and by right clicking on displayed result record you can open the day that particular history record occurred. If you need to see specific period of your history - you enable limits and select what you need and press looking glass button in the search bar to execute the search. Alternatively you can execute a search with some very common keyword like a dot (.) so norwell will display all of your history in front of you. You have to keep in mind that i'm not a professional programmer, i'm not a programmer at all. Early version of norwell had a bit more convenient way of traversing the recent history, but i had to drop it for simplicity sake, not to mention that native firefox functions are very buggy in that area and many other areas. A little documentation could perhaps accelerate the first approach. I imagine this extension would have saved me some time during a search a few weeks ago, I do not remember the details. When I have the same type of search to do again I can tell you. For the time being I am going to look for a way to separate pages in categories, probably with labels, to avoid to mix up technical searches, searches for a job, search to find a pizza for the lunch, and searches about the next holidays. No matter if I enable limits or not, Norwell continues to show ONLY today visits. Why? In this way, it is useless. pista wrote: No matter if I enable limits or not, Norwell continues to show ONLY today visits. Why? Anything is useless or dangerous if it doesn't work as advertised. Do you click on looking glass icon after selecting limits?